'The Yeomen of the Guard' was presented for the second time in November, 1911, and the following month another performance was given at the Hill End Asylum, not without backstage difficulties. Chief among these was the excessive temperature in the dressing rooms, which contained the heating plant for the building, so that the make-up melted as soon as it was applied ! This incidentally, was the first time that the Thespians had ever staged a major production away from Hitchin. Following 'Yeomen', it was decided to put on 'Merrie England', but the committee having concluded that it would be impossible to produce the show satisfactorily on the Town Hall stage, negotiations were opened with the Town Council for an enlargement of the stage accommodation. When the Council announced that it was unable to sanction the suggested outlay, 'Merrie England' was discarded and 'Patience' chosen in its place. Further complications, however, were caused by the illness of the conductor, William Wurr, and the performance, originally fixed for November, 1912, had to be postponed until January, 1913, with Mr J. H. White as conductor. 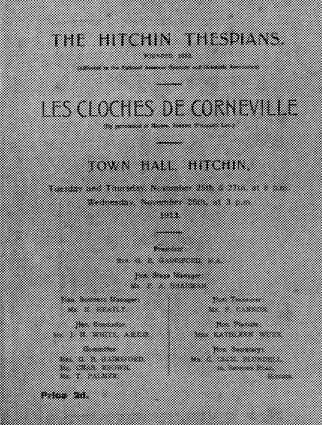 Though the choice of 'Patience' had continued the Gilbert and Sullivan tradition, change was in the air and in November, 1913 'Les Cloches de Corneville', as typically French as the previous productions had been English, was staged, The translation of the French libretto was considered to be not of the best and it was revised for the production by Mr Charies Lee, of Letchworth - not the only occasion on which considerable revision of scores and libretti has been found necessary. The production was not a financial success, but the public acclaim of the new departure to 'opera-bouffe' and their reception of the performances demonstrated to the Thespians that new fields were opening to them. Ladies, incidentally, were still earnestly requested to remove their Hats (whether or not the use of a capital letter indicated that the hats were now bigger is not clear). The programme also announced that 'A Special Train will leave Hitchin each evening for Letchworth and Baldock at 11.15 p.m., for Stevenage and Knebworth at 11.45 p.m.
Now, however, Europe was plunged into war and the activities of the Society, like those of so many others up and down the country, were suspended for the next four years. On May 15th, 1919, a meeting in Hobley's restaurant was called by public advertisement to gather together the remaining old members of the Thespians and to seek new recruits. This was attended by twenty-three interested people and at a subsequent general meeting on October 17th, 1919, new officers were elected and the next show chosen. So good, in fact, was the response to the call for singers and actors that it was decided to hold auditions, even for previous members. This ordeal over, the Society made its post-war debut with a performance of 'The Gondoliers' at the Town Hall in April, 1920. A fortnight earlier, the Dramatic Section of the Society had presented the then highly popular play, 'Mrs Gorringe's Necklace,' enthusiastically received by good audiences. When, after three performances of 'The Gondoliers', the Press wrote that its production had been 'one of the most notable of its kind ever given in the town', the Thespians felt that they had begun the second phase of their history in fitting and encouraging style.